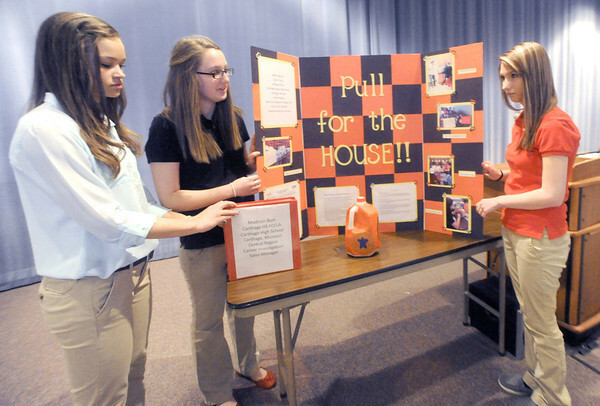 From the left: Carthage High School freshman Madison Burt, Sadie Freeman and Caitlin Tracy prepare to display their gold medal winning projects during the Family Career and Community Leaders of America Region 11 awards ceremony on Friday at Missouri Southern State University. with the honors, the trio will advance to the FCCLA state competition in late March in Columbia. Burt's project was a career investigation into sales management, while Freeman and Tracy teamed up to raise money for the local Ronald McDonald House by collecting pop tabs from cans. About 1,500 students from 20 schools participated in the event.